LYON - This Tuesday the French government of Emmanuel Macron has decided to suspend the increase of the price of fuels enacted a few weeks ago. 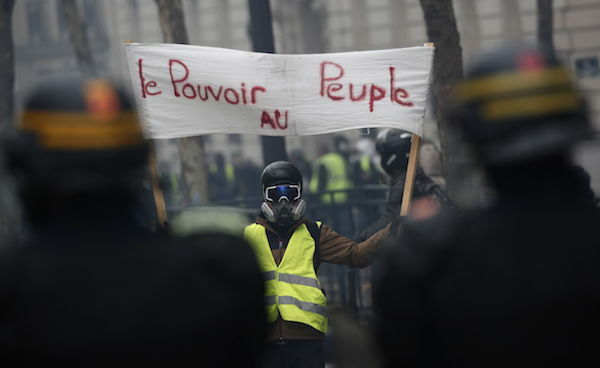 After protesters organized to oppose the ensuing increase in gas and diesel costs, the Yellow Vests (Gilets Jaunes) movement took to the streets across France to denounce the high cost of living, and their overall dissatisfaction with the overall state of affairs in the country. 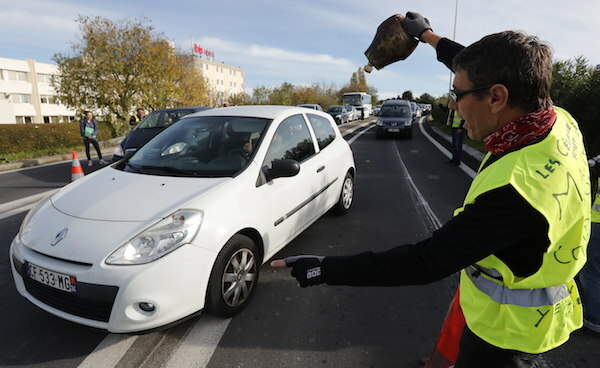 Since Saturday, Nov. 17, thousands of people nationwide have adopted yellow safety vests - required by law for motorized drivers - as a symbol of protest against one of France's least popular governments in recent years. Historically, the French government has subsidized the production of diesel engines in the country, which resulted in an increase in the consumption of vehicles using this fuel. However, the government led by Emmanuel Macron - a banker-turned-politician - has flirted with neoliberal policies as part of its economic platform, having raised the cost of gasoline and diesel since the beginning of the administration in 2017. Macron has argued that this is his battle against climate change. However, one of the fundamental motivations for this measure has been the increase in oil prices worldwide. "The tax on hydrocarbons, which is approximately 60 percent of the price of fuel, only partially benefits the energy transition," the newspaper Le Figaro explained. "The increases announced by the government will benefit almost completely the general budget of the State." During 2018, the tax caused an increase of 7.6 cents per liter of diesel and 3.9 cents per liter of gasoline, which would grow almost exponentially during 2019, according to the Energy Reporters analysis. Between petitions on Change.org and coordination through Facebook, the first demonstration was organized on Nov. 17, when protesters were encouraged to block the roads as a symbol of opposition to the increased fuel prices. The first day of protests started were "peaceful", "nonpartisan" and "spontaneous", with 300,000 people improvising barricades, and blocking traffic and access to up to ten fuel depots. 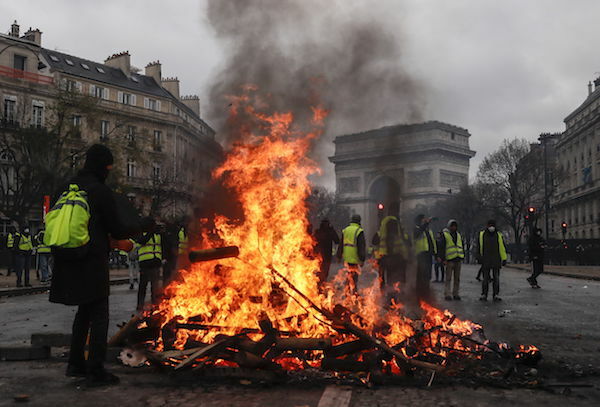 However, the tense calm soon broke - most notably in Paris - and the confrontation between those who wished to pass and the demonstrators resulted in more than ten injured, as well as the death of a 63-year-old woman. Homophobic, racist and Islamophobic aggressions transformed the entire nature of the demonstration, bringing to light the violence contained within French society. In the days that followed, confrontations with the forces of public order increased, despite the number of protesters decreasing. There were even reports of explosive vests in Angers. A mass mobilization for the resignation of the president of the Republic began. Although the demonstration began as opposition to economic measures, the sentiment soon evolved to include the overall sense of inequality, and the general dissatisfaction of the French people. National statistics have determined that economic income per capita has fallen by 1.2 percent in recent years, a downward turn that has affected the middle class - 68 percent of the population - in particular. The middle class suffers most from the increase in taxes, considered one of the highest in the world. Emmanuel Macron arrived at the presidency thanks to being just "the second worst option," after the country rallied to prevent his opponent, right-wing extremist Marine Le Pen, from being elected. That did not imply that the country felt at home with the young banker, however. His popularity has fallen to historically low levels, especially due to his attempts at economic reforms that have earned him moniker of an "aristocrat" removed from the social realities of his own people. This is why the Yellow Vests movement has proven especially strong in rural areas, and the most important aggressions have occurred in the wealthier neighborhoods of Paris. For the political scientist Jean-Yves Camus, Director of the Observatory of Political Radicalism at the Jean Jaurès Foundation, this movement represents a direct confrontation with the status quo of the Republic. "This paroxysmal violence, like the threats addressed to the deputies through social media, means that a certain number of French people are not just in a stage of disgust with the political class," the specialist told Le Parisien newspaper. "Not only are they saying that these people do not represent us, but they really want to overthrow them." Likewise, Camus added that discontent is also an issue within the population itself. "We rarely reinvest [reality] with nice words. More worrying still, this claim is no longer directed only at parliamentary representation and parties. It's a sign that there are French people who cannot stand each other." Will the rebellion defeat the President? Last weekend, the violence in Paris spiraled out of control. Dozens of cars were burned on public roads, barricades blocked main avenues, and confrontations with the police seemed like a real pitched battle. After weeks of denouncing the violence and showing a "strong hand" before the international press, the Macron government finally decided to suspend the increase in fuel prices. "No tax is worth jeopardizing the unity of the nation," said Prime Minister Édouard Philippe when announcing the decision. The widespread discontent of the people, especially in the provinces, has allowed the government's decision to invert the relationship of power on the matter, and the President is running the risk of having to resign to end the crisis in the country.